This delightful Winsor & Newton Lightweight Metal Sketchers Box contains a selection of 24 Winsor & Newton Artists' Watercolour Half-Pans. This set uses pure pigments rather than mixtures of lesser colours and have the full qualities of transparency and permanence. Box folds out to provide several mixing areas/ palettes. This is ideal if you are an Artist starting out and practising with your Watercolour mixing skills or an Artist that is on the move. Small, lightweight and easy to fit into your bag. This set is ideal for you. Showing 3 of our total 7 reviews, with an average rating of 5 stars. 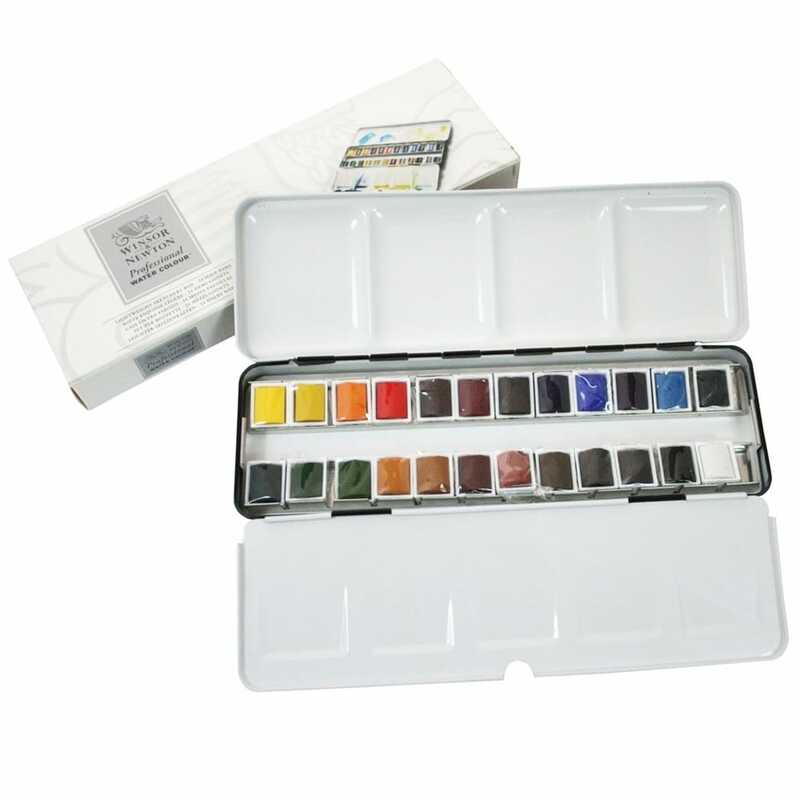 Read all 7 reviews for Winsor & Newton Artists' Lightweight Sketchers Box 24 Half Pans. I have bought the Artists Lightweight Sketchers Box 24 for my granddaughter for Xmas. It came the next day and when I opened it I was so delighted. It is amazing. All those wonderful colours. I would actually like to keep it myself! It was an excellent value. You couldn't even buy the paints alone for that. I am new to watercolour and have yet to try these paints out. What I can say is the set is the best value for money I could find after extensive search of web and I am delighted with the palette. There is room to fit another two half-pans alongside the others in the top and bottom row and if you dont want to use the middle space for a brush you can fit 12 half-pans there as well by turning them sideways. So plenty of room to expand. The colour range out of the box is good providing me with enough to get started. I was advised to learn with professional paints having more pigment so lasting longer so in the end costing no more. The palette is metal of sound quality light to hold feels easy in the hand and has a fold out flap for extra mixing space as well as lid. Forty pounds is a great price as the set often retails at 50 to 80 pounds or more. To buy the half pans separately would cost hugely more. So great value. My art teacher recommended this set and it is absolutely clear why: the pigment is far superior to my previous watercolours. After looking around Crafty Arts offered the best price by a considerable margin.